Once while I was on retreat at Lebh Shomea in south Texas, Father Francis Kelly Nemeck, OMI, offered me this thought during spiritual direction: “When we are ready, when the time is right, God shows us the gifts.” I was to remember his comment a couple of years later on another journey from San Antonio to Lebh Shomea. That particular March morning, as I slowed down on U.S. 281-South to enter the town of Falfurrias, I noticed a large weathered sign on the right. Apparently I was “ready” and the time was “right” to read the words printed in large black block letters: DON PEDRITO JARAMILLO SHRINE. On at least three prior trips that sign had never caught my eye. However, the name sounded familiar and I remembered seeing glass votive candles labeled “Don Pedro Jaramillo” on the shelves in several South Texas grocery stores beside other candles bearing images of la Virgen de Guadalupe, San Antonio, Divino Espíritu Santo, and San Francisco de Asís. Though I was curious, I also was looking forward to my Lenten retreat time and therefore continued on my way without stopping. After a left turn in Falfurrias onto the east-bound state highway, behold! 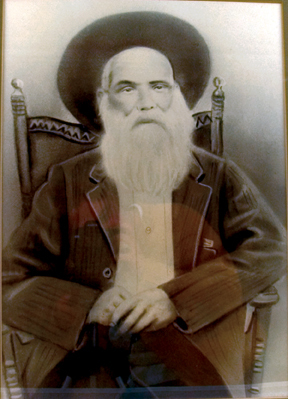 There was an identical weathered sign announcing “Don Pedrito Jaramillo Shrine”― this time with the arrow pointing north. Still I passed it by, wondering who “Don Pedrito” might be. Five days later, after morning Eucharist, I loaded my car and set out for home. It was a hot, muggy South Texas spring day, weather that made me grateful to be in an air-conditioned car. Somehow I knew that I would not again pass by the Don Pedro Jaramillo sign without following that red arrow. East of Falfurrias, when I spotted the now familiar sign, I turned north onto a secondary gravel road, seeking . . . Well, I don’t know what I was seeking, except to know something more about this Don Pedro. That he was known as “Don Pedro” or “Don Pedrito” already told me that he was held in high regard. I suppose that I was hoping to learn why. Many came to him because, unlike other faith healers, he claimed no power of his own, but said that God’s healing was released through faith.He made no charges. Patients gave or withheld as they chose. But whatever was given voluntarily he often gave to the poor — food as well as remedies. How many times did Jesus say, “Your faith has made you well,” or “Your faith has healed you,” or “Your faith has made you whole”? I realized that, unawares, I had come to a pilgrimage site. My second surprise was that the shrine (or santuario) sits in the midst of a small cemetery. Somehow it had never occurred to me that I might be visiting Don Pedro’s actual gravesite since the saints with whom I was familiar were from other places and other times, from far away and long ago. Holy women and holy men were not from the century in which I was born (Don Pedro died in 1907) and certainly not from an out-of-the-way place so near my San Antonio home. The shrine was a one-story brick building, about 20 feet square and of indeterminate age. Since the door was closed (and given the current city custom of locking churches), I wondered whether it was open for visitors at all. No one was around to answer my question if I had asked. After reading the biographical information on the marker, I tried the hasp on the gate, found it unlocked, and followed the short sidewalk through the cemetery to the chapel door. Pulling gingerly on the door handle, I found that it was open, took a deep breath, and prepared to enter. What I remember next is the whoosh of hot air that enveloped me when I opened the door completely ― a thermal gust hotter than the sultry air outside. Stepping inside, I felt time and place, curiosity and haste, fall away. I stood in a silence so profound that I could almost hear the sizzle of the flames as they consumed the wicks in dozens of votive candles burning on a metal altar table. All of the casement windows were closed and the small space felt both stuffy and confined, making it hard to breathe. But breathe I did, inhaling the faint fragrance of incense that still lingered in the air, a reminder that other visitors had preceded me. I was alone in the shrine. Slowly I regarded the scene. My eyes were drawn first to a wall where numerous metal crutches were suspended from nails. Above them and all around the room, hanging next to the ceiling were rainbow-colored artificial flowers. There were even some fresh flowers in vases at various locations. Two or three different images of the Blessed Virgin Mary rested on side altars or in glass cases. At several spots on the wall were bulletin boards overflowing with handwritten notes both in English and in Spanish: thanksgiving for healings, heartfelt petitions for intercessions to bring relief from illness or pain, hopes for divine assistance in business and all aspects of life. Frequently they were prayers or thanksgivings for what had been granted to someone other than the note’s author. Sometimes they acknowledged a grace received personally by the writer. Photographs were thumb-tacked on top of notes from the devout. Small metal milagros ― feet and legs, faces and arms, babies, and even farm animals ― dotted the space on top of these overflowing layers of notes and photographs. Prior pilgrims had left ample proof of Don Pedro’s effectiveness in working changes in their lives. Against one wall rested Don Pedrito’s tombstone with the epitaph: “Aquí yacen los restos de Pedro Jaramillo, el benefactor de la humanidad.” (“Here lie the remains of Pedro Jaramillo, benefactor of humanity.”) The grave itself occupied a large covered rectangle of the floor space. Beside the tombstone was a life-sized ceramic statue of the bearded Don Pedro dressed in suit and tie, his toes bare in open sandals. Some visitors had even draped necklaces with petitions and prayers around his neck. Worn kneelers in front of the statue and alongside the grave were places to pause for prayer ― and the marks of wear showed that many pilgrims had done just that. Somehow just standing in the shrine felt like prayer. On a table at the right hand of Don Pedro’s statue I noticed a bowl of water, holy water, I was certain. It felt cool on my fingertips as I touched it lightly and slowly drew my hand back to make the sign of the cross, forehead to chest, left shoulder to right, as I would during the Eucharist. No longer did I feel the heaviness of the air or its heat. A space seemed to open in my heart and I felt refreshed. With a final glance toward the chairs where many pilgrims had sat and the kneelers where others had prayed, I turned toward the door, opened it, and walked out into the spring sunshine of South Texas. Returning slowly to my car, I recalled my visits to Tepeyac in Mexico, to Chimayo in New Mexico, to Santiago de Compostela, all of them places made holy ― sanctified ― by the prayers and pilgrimages of the faithful. Now, nearly a decade since my visit to Don Pedrito’s Shrine, I believe that I understand what Jacob thought upon awaking from his dream, “Surely the Lord is in this place and I was not aware of it” (Genesis 28:16). Rilda Baker is a teacher, writer, and Spanish translator. She co-directs the Diocesan Retreat Society and is a member of St. Paul’s in San Antonio. Reach her at drrildabaker@gmail.com. I plan to visit the shrine and take my youngest daughter with me. She is in a inbetween in her faith. I went through that in college but snapped out of it soon after. What a beautiful story. I grew up taking trips with my grandparent from raymonville to don pedrito. After my grandmother pasted i had felt lost and just could not find myself. I then remembered that grandma had so much faith in don pedrito. With hardly no money my husband and I went to the shrine . When we got there i felt scared to go in for ome reason so my husband and i argued cuz i did not wantto go in alone. As we argued these night bugs got so loud my husband and i could not hear eachother speak. My husband grabed my hand and we walked in together . I remeber the outside but never the inside. I felt a wave of emotions . I felt like my grandma who i miss so much was the ‘re. With me proud of remembering faith is number one. As i teared up i kneeled asked god and n pedrito for guidance . Grandma always said ask for signs and you will get them . Sure enough i got my sign. Having faith is beautiful ! And having faith in god and don pedrito as gods helper is awsome.